Gorgeous relaxing home with pool. Stroll to Beach! Divine Woodlark Beach House at Sunrise Beach - Outdoor Pet Friendly. Come & Relax! Divine Woodlark Beach House in Sunrise Beach is an open, contemporary ONE LEVEL comfortable home with an abundance of natural light. A Stayz/ Home Away home rental since 2011, we encourage quality guest stays verses quantity. We offer accomodation for 1- 6 people. We accommodate couples or families/friends looking to have the best vacation ever - easily and comfortably in our expansive private space. With a central kitchen, 3 separate bedrooms & 3 different living spaces, our home is spacious enough for couples or small groups/families. Our home is decorated in fresh, warm, neutral tones with soaring ceilings in the living area, private space in the pool area and a fully fenced yard; Woodlark is designed for 'bunkering in' and winding down. We have WIFI, Foxtel & in January 2018 we also upgraded our flooring to timber laminate & updated our bed linen & carpets, so the whole house is refreshed for your enjoyment. We are positioned within 700 m (5 minute stroll) to one of the Sunshine Coasts best kept 'beach secrets' - Sunrise Beach; whether you wish to walk hand in hand, play with your dog on a lead free beach or take your kids down for a pristine beach experience- we offer it all! Outdoor pets are welcome at Divine Woodlark & love to roam on the pet friendly beach. If your dogs are outdoor dogs & are trained to stay off furniture -then bring them along for no extra cost! Please ensure you include them in your booking request & let us know their breed and their pest maintenance program at booking. Tariff includes LINEN, TOWELS,PILLOWS, BLANKETS, BEACH TOWELS. With a fully fenced back yard - DWBH is ideal for children and outdoor pets. Please check out our reviews or contact the owner for a chat. * Large bathroom with deep bath! Zoned OUTDOOR seating area - table for 6 or 2 '"Muskoka Chairs for catching the morning & afternoon sun. Divine! * Fully fenced and landscaped backyard - great for pets and kids. Our property is advertised on Homeaway & Aibnb. Please refer to either of these sites for accurate calendar & pricing information. We require proof of ID for all guests. We run a quality holiday rental & our pricing model includes linen, towels etc. Guest charges after 2 are $30 per person, per night. Cleaning fee is $140 for 4 hours. Additional time charged at $35 per hour. 1- are for cots & baby hire equipment. We direct our guests to the service providers for a direct price outside your holiday tariff. 2- adding on extra guests after your booking has been confirmed. We have a one level home with small step up from entry & backyard. The showers have hobs. We had an amazing time in Noosa. The property was extremely clean, and the pool was wonderful. The communications from Heather were spot on. Would love to return. Many thanks for your lovely review & for treating the house so well & enjoyed your stay - you were terrific guests. Please come back any time! 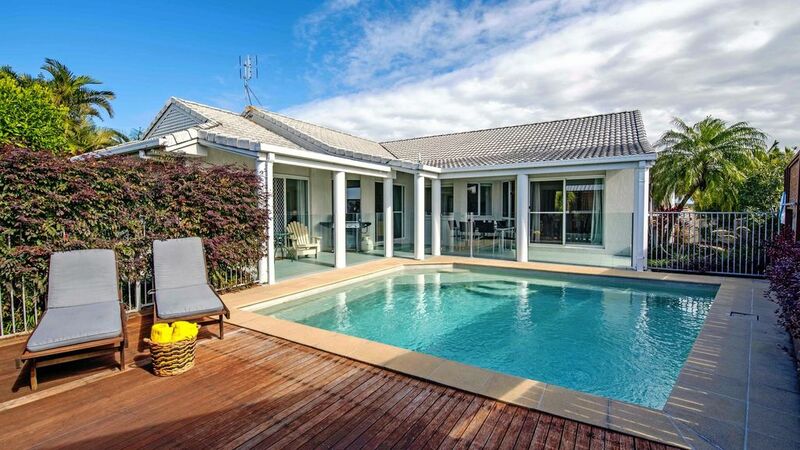 Amazing pool, and a thoughtful, comfortable and lovely home suitable for all ages. We were struck by how well everyone was catered for and how well stocked the kitchen was. Thank you for our brilliant family holiday! We plan on returning soon. We’re so pleased that you & your family adored Divine Woodlark. Happy to host you anytime. Great position. Multiple sitting areas. Fantastic facilities. We enjoyed 3 great nights at DW Noosa in December 2018. The house was extremely clean & spacious. Amenities amazing. Communication & recommendations fantastic from owner. Property is a short drive to Sunshine beach shops. Uber drivers find the property easily if you’re looking to leave your car at home rather than fight for a space in town, which is recommended. Swimming pool welcome relief from the heat. Many thanks Heather & family. Hope to be back again soon. Many thanks for your lovely review. So pleased that you & your family enjoyed your special get away celebration. We think it’s a little piece of paradise & are happy you’ve enjoyed your stay. We came up to stay for a family wedding. There were 6 adults (2 couples). Room to relax without being in each others pocket, plenty of seats, tables and chairs, couch space in the two living rooms. We had lovely weather during our stay but if you needed to be indoors, theres plenty of room. Bedding comfortable, bathroom facilities spacious. Things I wanted to know and vouch for in my rental searches: bathrooms and multiple mirrors with space, good shower pressure, natural light, plenty of mirrors available to get ready with. Seperate toilet. Support handle/bar in toilet and master ensuite shower (for those a little unsteady on feet/recovering from injury or surgery etc). All bedrooms weren't on top of each other. One of our guests slept on the futon in the front study/room and said it too, was comfy (3nights). Kitchen has lots of room and we used all appliances (oven, microwave, stove top, dishwasher, full size fridge/freezer, toaster, BBQ) many other appliances. We were provided enough platters/kitchen utensils, storage containers, pool serving ware, glasses cutlery and basic pantry items available too. There were 3-4 TVs available for use and the main living space had foxtel. We also had free WiFi. We enjoyed use of the pool - it gets lots of lovely morning and early arvo sunshine. All windows were fitted with flyscreens and we had them open most of our stay with great air circulation. The bedrooms also had split system AC. The neighborhood is quiet. Close to Sunshine beach and main Noosa town shops. We did have a couple of cars so we took short <5min drives to get supplies/sightsee. Very popular time due to the Triathlon on the same weekend. We had a lovely stay, cannot fault the location. Heather was a lovely host who provided good clear information about the property and was available should we have needed her with any queries/concerns. We would definately return to stay at the property.